1. Place the dried fruit and mixed peel in a large glass bowl. Pour over the brandy, mix well, cover and place in the fridge to soak overnight. 2. In a large bowl, mix together the flour, baking powder, breadcrumbs, sugar, spices, citrus zest, suet, apple and almonds. Stir in the soaked fruit and any remaining juices. Add the beaten eggs and stir until well mixed. 3. Lightly butter a 1.2-litre pudding basin and place a disc of baking parchment in the base. Spoon in the mixture, cover with 2 sheets of baking parchment topped with a double layer of foil and tie in place with string, making a handle for lifting. 4. 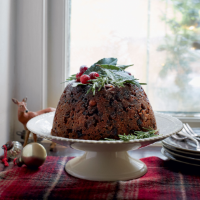 Place the pudding in a large saucepan and pour hot water halfway up the sides. Cover and steam for 6 hours, topping up with hot water from time to time. 5. Lift the pudding basin from the pan and leave to cool completely. Remove the foil and baking parchment and cover with fresh sheets. Store in a cool, dark place for up to 6 weeks. 6. To reheat, steam for 2 hours as before until piping hot, then invert the pudding onto a large plate to serve. To flame the pudding for serving, warm 100ml brandy in a small saucepan but make sure you don't allow it to boil. Pour it over the pudding and, keeping it at arm’s length, quickly ignite. This recipe was first published in Fri Oct 30 11:28:00 GMT 2015.